Listener emails and book reviews – This week, Team Mousetalgia goes back to the mailbag to answer listener questions on topics as varied as Disneyland’s train stations; the best locations to view the parades, Fantasmic, the fireworks and DCA’s World of Color; Disney cookbooks; remembering the original Disney Channel, and more! 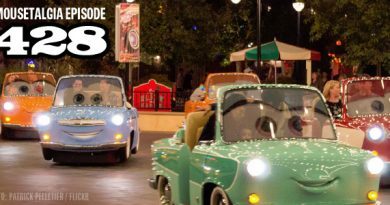 Plus, we discuss our latest reading materials, covering topics that include Disneyana collectibles, Disneyland trivia, Walt Disney World history, and stories from a theme park insider. Also – more Tim Babb, another giveaway, and more!